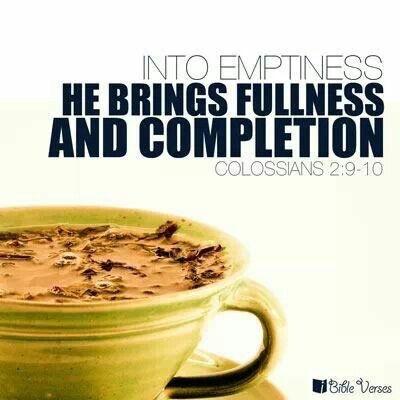 "For in Christ lives all the fullness of God in a human body. So you also are complete through your union with Christ"
What more needs to be said. In Jesus is everything God is. What's the logical conclusion. When Jesus said, "seek first the kingdom and all these things will be added to you." It has the weight of authority that comes from being the very source of life. He speaks with the authority that grants that truth. Because He said I AM truth. What else do you need to look for. Why look to management when you have access to the founder an owner? How much trouble would we all avoid in this world if we truly believed Jesus at His word and just looked to Him for all the answers, all our needs, all our comforts and all our provision? How much simpler would our lives be if we took Him at His word when He said come to me and I will give you rest.? What would our world look like if those who declare to follow Him actually trusted completely The Word of God who is The resource for all of life. Newer PostWe all need (The Right) someone to lean on.